Fillings, crowns, and bridges are all types of dentistry used to help restore or replace damaged or diseased teeth. At Capitol Smiles Dental in Trenton and Ewing New Jersey, great care is taken to create a custom dental restoration plan that will suit each patient's needs perfectly. He took time to make me comfortable and procedure was well done. He is the BEST dentist! Crowns are tooth covers typically crafted from either ceramic or porcelain. Crowns are used in a variety of situations when teeth are damaged or decayed. They may be used to cover chipped teeth, cracked teeth, dental implants, and to reinforce teeth after root canal therapy. Crowns can also act as support, forming a type of anchor for dental bridges. A bridge is a prosthetic tooth or set of prosthetic teeth. Bridges fill in the area between natural teeth, creating a bridge that allows the natural teeth to stay in place without shifting into an empty gap. There are 3 different types of bridges. A traditional bridge has crowns anchoring 2 sides of a gap. A cantilever bridge has only 1 side anchored. A Maryland-bonded bridge includes plastic teeth and gums. This type of bridge is entirely supported by a metal frame. How are bridges and crowns installed? 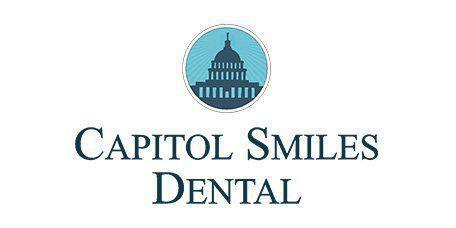 The creation and placement of bridges and crowns typically requires at least 2 visits to Capitol Smiles Dental offices. During the initial visit, the teeth are examined and the potential solutions are discussed. At this time, a custom mold of the patient's mouth is created. This mold serves as a model for the creation of a custom bridge or crowns. During the second visit, the patient typically has a teeth cleaning and polishing in preparation for the placement of the bridge or crown. The custom bridge or crown is then implanted, and the dentist checks for a perfect fit. To fill a cavity, the dentist first administers numbing medicine that allows the patient to be comfortable during the procedure. The damaged tissue is then removed and replaced with a filling. There are a variety of materials used to fill cavities today, including silver amalgam, composite resin, gold, porcelain, and plastic. Composites are especially popular because they bond with the natural tooth to create extra support. They also look completely natural, blending in with the other teeth since they're tooth colored.